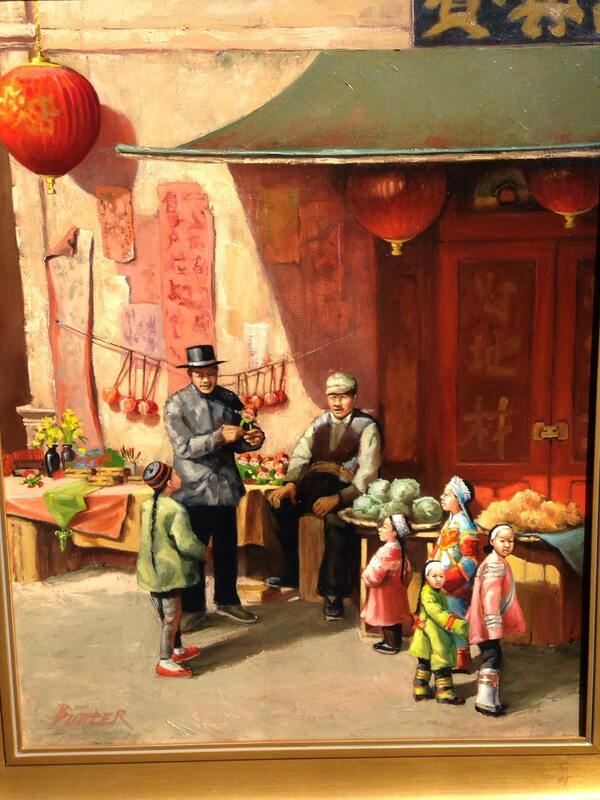 1800s San Francisco Chinatown Scene Painting by American Artist Pris Buttler 24" x 30"
This contemporary painting depicts a scene in Chinatown during the turn of the century in Chinatown before the Great Earthquake. Buttler is an interesting artist because she is both technically very skilled and also has a wide array of subject matter. Buttler paints brilliant Western landscapes as well as historical portraits and even surrealist works. Pris Buttler has studied architecture and advertising. Additionally, she designs patterns and teaches design to rug hookers. Her painting skills have garnered her numerous awards and her work is owned by any number of important collections. She currently resides in Georgia, but also painted previously for a number of years in California. 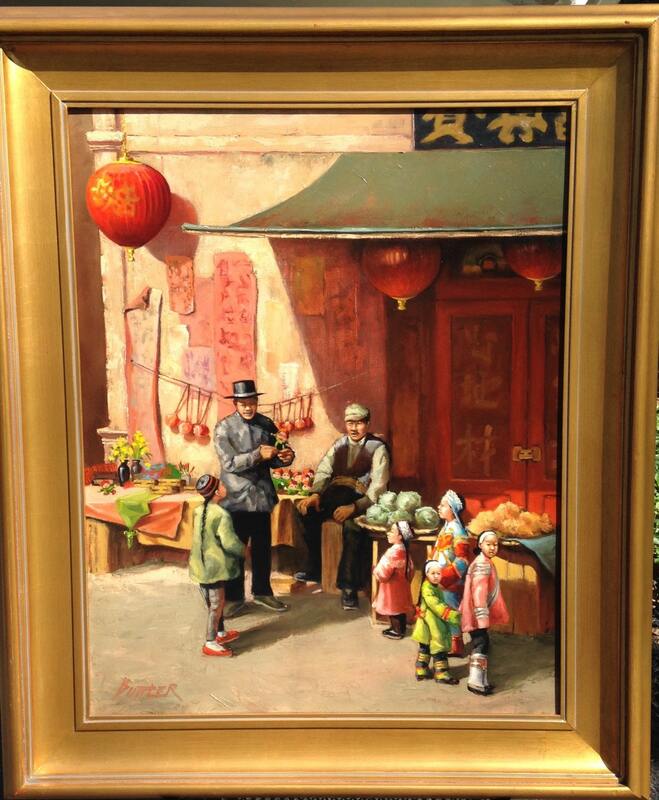 This piece features a scene of a father buying a young boy a new toy from a Chinatown vendor and it entitled on the verso, "The New Toy". 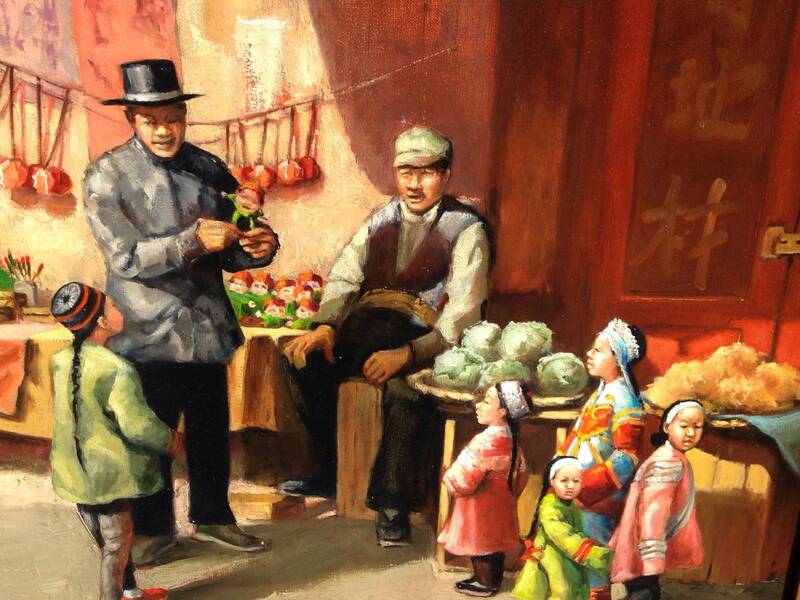 The whole scene is consistent with the burgeoning culture of the Chinese . Beautiful brush strokes and thickly painted. Signed at lower left in red. Professionally framed in a 4" gilt wooden frame. The color palette is vivid and exciting. Would look incredible in a San Fran home! Dimensions: 24" x 30" image size; 32" x 40" framed.